While it’s rare for most venues to ever face these types of life or death emergencies, Simon said the same sense of responsibility should apply to all of the daily rituals that keep a venue clean and safe for guests and staff alike. “Safety is always the top concern for our guests,” he said. “We look for anything that could present a problem before it happens. For example, even though a lot of guests at Paradise Park wear flip-flops in the summer, they create a safety hazard in go-karts, climbing the rock wall or running through a laser tag field. “We provide alternative footwear to make sure our guests don’t miss out on those attractions if they didn’t come to the park prepared,” he said. Philly Mini Golf is a fun diversion offered at Franklin Square. A security service maintains a 24/7 presence on the property year-round. The miniature golf course at Royal Oak Golf Center may be among the most challenging courses in the country. Designed as a mountain-style adventure, all 18 holes in this Royal Oak, Michigan-based venue have been testing the skills of kids and adults year round for years. Glenn A. Pulice, general manager of the center, said that the staff has a few rules in place to ensure that players enjoy their games while staying safe. “The best way is to be preventative,” Pulice said. Pulice said he’s also recently hired a retiree who works, on average, about two and a half hours a day for three days a week to specifically to do pruning, cleaning and looking for safety issues around the course. They also post rules and regulations throughout the venue. 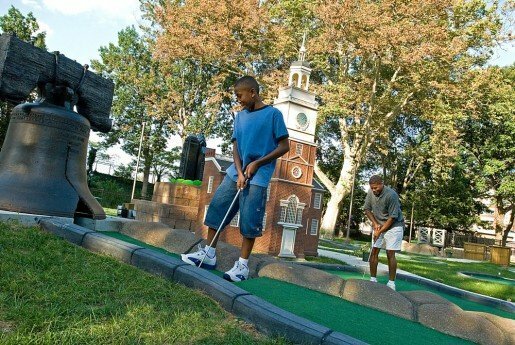 At Franklin Square in Philadelphia, a miniature golf course in the heart of Philadelphia’s historic district, tourists flock to play a round or two every summer. But because the course is located within a public park, sharing the square with Parx Liberty Carousel, SquareBurger (a restaurant), Franklin Square Fountain, the Pavilion in Franklin Square (which is used for parties), the Living Flame Memorial for fallen police and fire fighters, playgrounds and lawn areas, John Wilson, Franklin Square’s director, thinks a lot about safety both in terms of customers and the distinctly urban location. The Franklin Electrical Spectacle is a light show in Philadelphia, Pa. The city’s Franklin Square faces the special safety considerations of being located in a major United States city. Photo by Jeff Fusco for Historic Philadelphia, Inc. 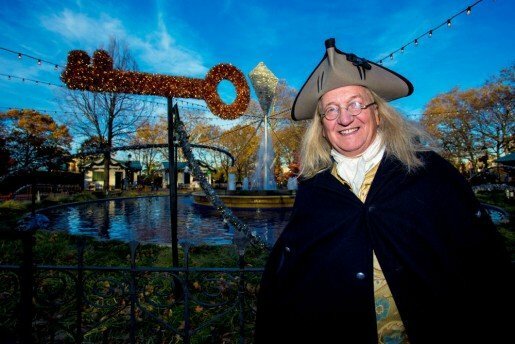 While Wilson admitted they have had people escorted out of the park for being disruptive, during non-operating hours, he employs a security service to be onsite to maintain a 24/7 presence on the property year-round. “There are general park rules posted at each entrance to Franklin Square,” said Wilson, including hours of operation, things requiring permits, no fire, no alcohol, etc. Each attraction, like the Philly Mini Golf, Parx Liberty Carousel and the Franklin Square Playground, has more specific rules posted at each entrance. 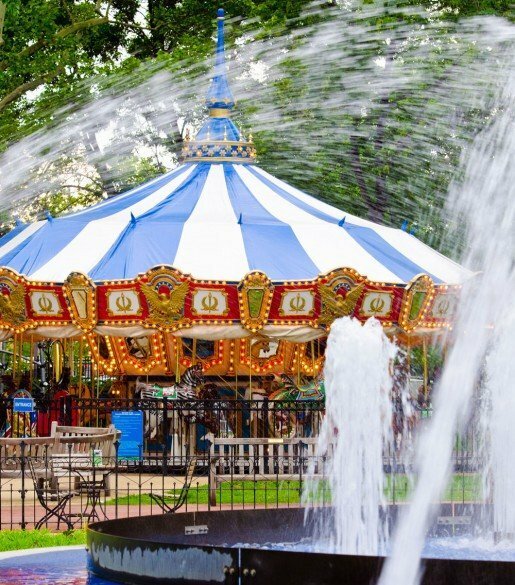 For example, the Carousel is a ride regulated by the State of Pennsylvania Department of Agriculture, and as such, specific rules are required to be posted. Because the mini-golf venue is so public (a few blocks from Independence Hall and some of the nation’s most respected historic sites) maintaining decorum is as much a part of the safety protocol as keeping an eye on people swinging clubs erratically. That the venue is located in one of the biggest cities in the country also poses some challenges from time to time. The Parx Liberty Carousel at Franklin Square in Philadelphia, Pa. The park has a supervisor and a visible police presence to keep visitors safe. Photo by Jeff Fusco for Historic Philadelphia, Inc.
Also located in Philadelphia, Adventurer Mini Golf is an indoor urban fun center with an 18-hole black-lit course that delights players with décor ranging from an Amazon jungle and frozen tundra to the pyramids of Egypt. The site, which was custom-built in a newly renovated 12,000-square-foot warehouse in South Philadelphia, also features popular arcade games. “We have security cameras that record and monitor the premises,” said Robert Dudzieck, owner of the venue. Emergency exits are also clearly labeled throughout the center, and the staff keeps a close eye on guests who are playing mini golf to ensure, for example, that no one is swinging clubs overhead to risk injury. The center also provides a variety of golf club sizes for kids and adults. A club that may be too short or too tall isn’t generally comfortable and can create problems, especially for children. He said the staff also inspects the course daily to look for any loose obstacles and turf, and to replace or fix anything that may be broken. At Big Rock Fun Park in Little Rock, Ark., safety is the number one concern, said Jeffrey Marks, assistant general manager. In addition to go-karts, mini golf and an arcade, the park also features batting cages, laser tag and bumper boats. Marks said safety protocols stretch through to each of the attractions. For example, there are quite a few important rules and regulations in place to ensure the safety of go-kart riders, both for visitors and operators. “All of our operators are required to complete training on the go-karts when they are first hired,” he explained. “The operators check each seat belt to make sure the customers are strapped in correctly and safely.” The park also has a special brake test that is unique to the venue. “We make each kart pull forward and brake before the race begins to ensure each car is running correctly,” he said. The rules are also read aloud over a microphone system prior to every race. The height of riders is also checked in advance to make sure they meet safety requirements.